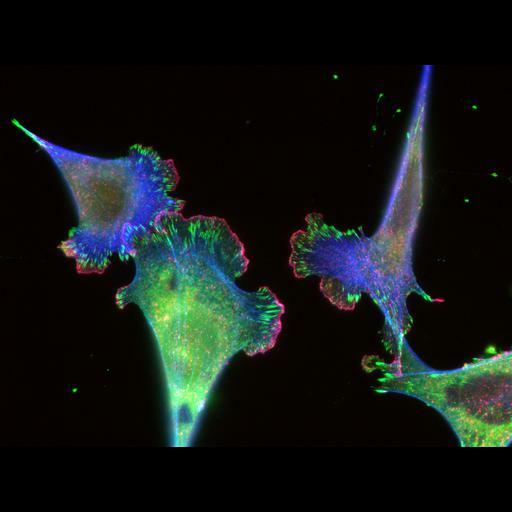 Mouse Embryonic Fibroblasts (MEFs) grown on glass coverslips coated with 10 ug/ml Fibronectin. After 24 hrs cells were fixed in 3% paraformaldehyde and stained with mouse antibody to Paxillin, rabbit antibody to cortactin, followed by anti-mouse Alexa 561 goat antibody for Cortactin (cblue), anti-rabbit Alexa 647 for Paxillin (green) and Alexa 488 phalloidin (red) to stain for F-actin. Images were collected on a Nikon Eclipse imaged with a cooled charge coupled device (CCD; Orca II; Hamamatsu Photonics) using a 60x 1.4 NA Plan Apo PH objective lens (Nikon). Individual exposure times were used for each channel: 488: 200ms, 568: 200 ms, 647: 50 ms.